The reality of cemetery theft and vandalism. Cemetery vandalism is not a new problem, but is one where the perpetrator needs to have the harshest possible penalty since the actions of cemetery vandals damage not only property, but they also have an ongoing impact on the lives of any living descendants of those whose final resting places are desecrated. Cemetery theft and vandalism is not an isolated issue, but is a problem common to cemeteries throughout the world. Incidents of theft and vandalism may occur either as an act of criminal intent, or with political or racial connotation, or simply as mischievous activity. It is true that memorialisation is also effected by natural environmental processes and cemetery maintenance practices, and these may also be responsible for damage to memorials. A Memorial represents an emotional attachment (commemoration of the life of a loved one) and a materialistic value (memorials are expensive) and signifies the existence of a past life on earth for future generations. This dignity and respect must remain intact. 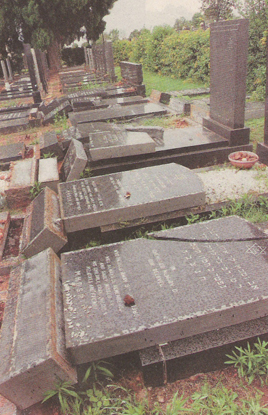 Cemetery theft and vandalism is not an isolated issue, but is a problem common to cemeteries throughout the world.